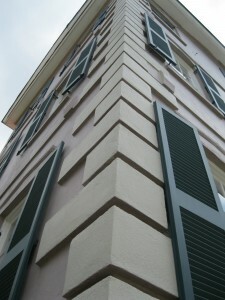 A very common architectural detail in Charleston is the “quoin”. The word is derived from the French word “coin”, pronounced “cwahn”, and means “corner”. The idea in architecture is to add a heavy corner structure to help support a building’s walls. The ancient Romans and Greeks figured out that load-bearing must be stabilized at certain points, otherwise walls could collapse, so heavy granite blocks were built in corners to create that stability. The quoin also gives a building a very distinctive, decorative look, and as classic architectural styles influenced Western Europe by the 17th century, quoins became all the rage. 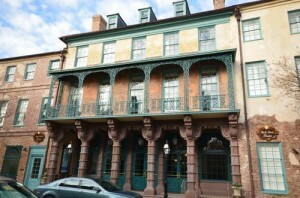 This idea came to Charleston in a variety of forms by the 1720’s, with new Georgian styles in buildings that usually mimicked the stone corner with sections of brick that were built to protrude, then covered with stucco to resemble a solid block. Some expensively-built buildings, such as the 1801 City Hall (built as a Federal bank), feature true stone quoins, but the vast majority of quoins around the city are brick beneath, stucco on top. As a young boy growing up on Legare Street, I learned the gret value of quoins to downtown residents who had locked themselves out of the house. A quoin is a fairly easy climb to get to a second floor piazza, and was most notably used at our old family house in 1985. My brother was getting married in Columbia, two hours away, and after the ceremony, was to fly off to his honeymoon. He realized, leaving the church, that his and his new bride’s passports were sitting back on Legare Street. So, we called a neighbor, she climbed up the quoins to the second-floor piazza, let herself in the house, grabbed the passports, and sent them by courier to Atlanta, where the flight was departing. The passports got there, the honeymoon was a success, and it all was made possible by the ancient idea of the quoin. In one of the city of Charleston tour guide lectures at the Dock Street Theatre, local guides were given a very informative account of the buildings history by the theatre director, but there was one issue that I believe was incorrectly portrayed. The group was told that “certain tour guides” mistakenly refer to the current ticket office as a former restaurant, and the director showed images from the turn of the 20th century showing that space to be a retail store. I question that interpretation, having found an 1847 advertisement explaining that the hotel was expanded to include a “ladies’ ordinary”, which is a 19th century term for a restaurant. In addition, 1884 Sanborn Fire Insurance maps clearly show that the section that would become the retail store was part of the hotel. There is no other lgical place for the “ladies ordinary”, so I stand by the idea that the restaurant was in that spot. It does show that history can be a very imperfect discipline, and that much of the past is not explicitly detailed, so that interpretation must be made by the best information available, which in this case, I’ve trusted first-hand documents. Author adminPosted on September 19, 2012 September 19, 2012 Categories UncategorizedLeave a comment on Dock Street Mystery? 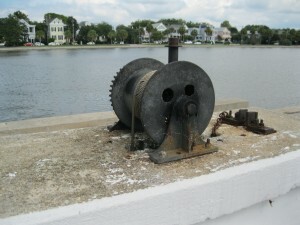 The old sluice gate mechanism at Colonial is a reminder that the water comes from the Ashley River, and that the city’s largest inland wetland was once connected to its source naturally. Old maps of Charleston’ peninsula show that most of the western side of the city was originally marsh and tidal basin, and Coming’s Creek once stretched well into what is now the heart of Radcliffeborough. In the era prior to steam engines, these vast wetlands were impounded with man-made dikes, trapping water that could be used to power rice and timber mills. By funneling tons of water through successively-smaller pipe openings, there would be a great force that could push sawing and winnowing mechanisms. 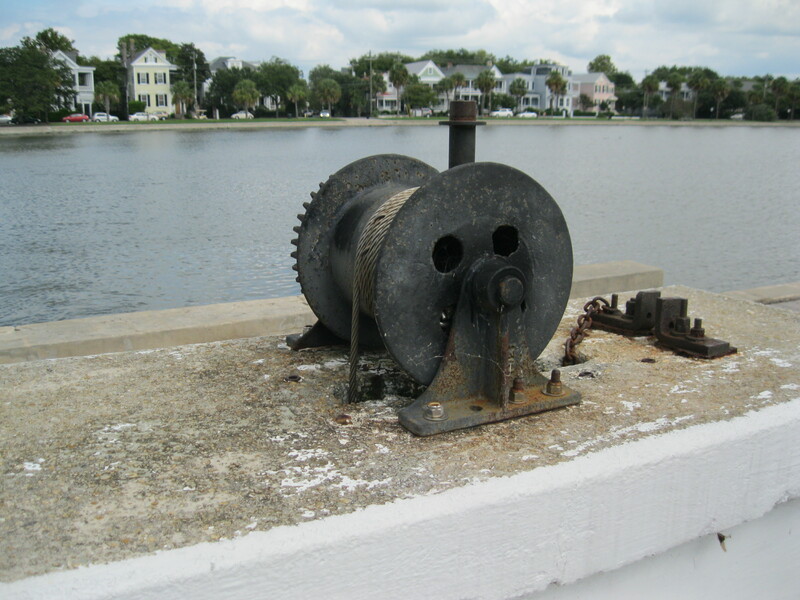 By the early 1800’s, the mill ponds were tapped for heating into steam power, and mills lined the western part of the peninsula. As rice and timber production waned after the Civil War, many of the old wetlands were filled for new neighborhoods, and by the 1880’s, the only significant area left was Rutledge Pond, a leftover recreation area bordering the Ashley River that had been established in 1768 as Colonial Commons. The city continued its filling expansion beyond the pond, a enclosed the area in 1881 as the new Colonial Lake. Ringed with cement and bordered by landscaping and a walking promenade , the lake was at the heart of “ten acres of lake, lawn and terrace” that proved to be a blast during the Victorian-era with fireworks displays during the autumn horse-racing festival celebrated as Gala Week. A burst of new building in the early 1900’s along “water lots” near the lake added fashionable houses on Rutledge Avenue and Colonial Street, as well as Baker Hospital, the city’s first specializing in surgery. By the 1920’s, the popular gathering place featured five-cent rentals of “swan boats”, propelled by foot pedals, and the beginning of an annual Christmas tree-lighting ceremony by illuminating a tree set on supports in the middle of the lake. Fed by tides through underground culverts, the lake has been home to fishing and fish tales, such as the Colonial Lake “monster” of the 1930’s, when a huge creature claimed to be seen lurking underwater. This underground gate still allowed a flow of water that has been used over the years for fishing an sailing tournaments, and each Christmas is illuminated with a lighted tree in the middle of the lake. 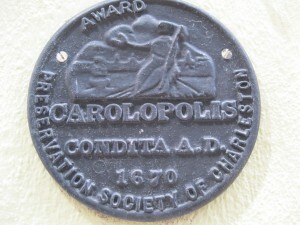 There seems to be some confusion over the interpretation of the plaques commonly displayed on Charleston houses, which reads, “Carolopolis”. I have heard people on tours being told that it is Latin for “Charleston”, but that is simply not true. The Latin word for city is “urbis”, and “polis” is actually the Greek name for city. According to the Preservation Society of Charleston, which has offered the award since 1953, the name combines the Latin “Carolus”, which means Charles, with the Greek “polis”, which means city. Charlestonians historically were taught both Latin and Greek, and our famous architecture is largely a combination of revival Roman and Greek styles. 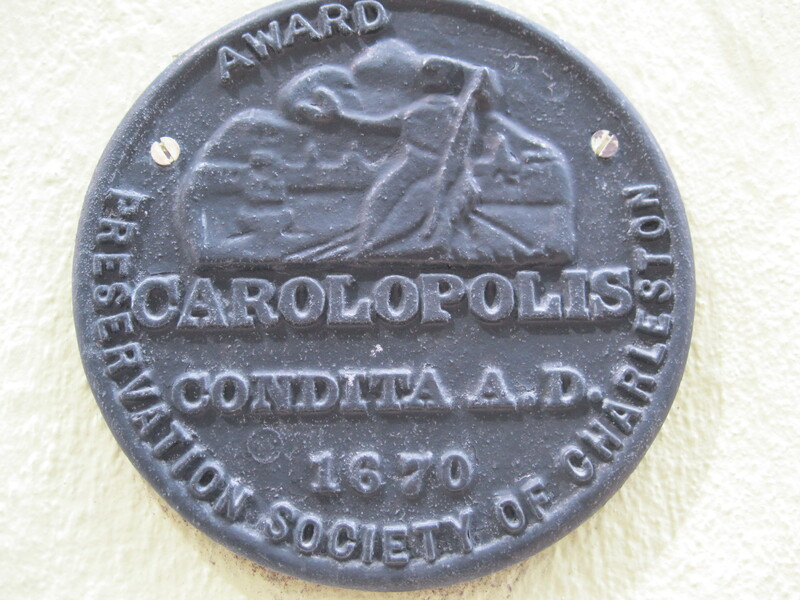 The Carolopolis Award is annually awarded to property owners who have restored, replicated or maintained historic architecture, and the distinctive round medallion also includes the year awarded and the term “Condita A.D. 1670”, referring to the founding of the city in “Anno Domini” 1670, which means “established in the year of our Lord 1670”. Along with the Carolopolis Award, a number of historic properties display markers designating a preservation easement. These legally-binding attachments to the deed restrict future alterations to both interior and exterior, and often stipulate that the property will not be sub-divided into condominiums. A conservation easement is perpetual, so once attached to the deed, it cannot be changed. Another common plaque on historic houses are “fire marks”, supposedly attached to buildings to show fire companies that a policy had been paid, otherwise they would not fight the fire. This is completely untrue, and most of the fire mark are reproduction fakes. Charleston city fire ordinances required all fire companies to respond to any blaze, and although there was a reward system for the first companies on the scene, it was not paid by the fire insurance companies, but by the city. Plaques, such as the common “Mutual Fire Insurance Company” are nice to look at, but no such company existed in Charleston – it was a Philadelphia company, and the marks were made in the 1920’s, long after Charleston went to public fire service. We were entertained today on the tour by a red-tailed hawk who was roosting in a tree in St. Michael’s Episcopal Church graveyard. 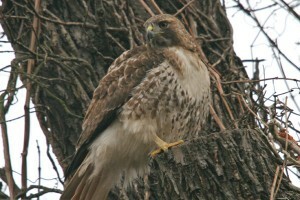 The big bird of prey is common throughout North America, but has really had its numbers grow here in the Southeast, and is very often seen in urban areas. The hawk has eyes that are strong enough to pick out small mice 300 feet away, and feasts on rodents from perches high in trees, or by circling overhead and swooping down. The red-tailed hawk is very evident by its ruddy-colored tail that fans out when flying, and it grasps prey with powerful talons that can easily dig through flesh and bones. The scientific name for the red-tailed hawk is Buteo Jamaicensis, so-called because the first discovery of the species was in the West Indies. They often fly in pairs and have long-lasting mates, communicating with one another with shrill whistling calls that have been used in movies to dub over eagles in flight, because it sounds so much better than the sound eagles actually make. Everybody on the tour was fascinated with the bird sitting so close by, but the bird was oblivious to us, simply watching for its next meal. filters meant to clean the refuse. 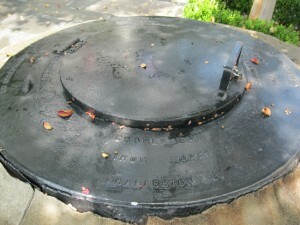 The original “lifting station” opened in the Spring of 1895 was located at the corner of Church and Water streets, where this massive iron manhole plate still stands. It was excavated down to 15 feet below the surface for collection of sewer, which is remarkable considering Water Street is former Vanderhorst Creek. The project was begun during the administration of mayor John F. Ficken, and succeeding mayors J. Adger Smyth, Robert Goodwyn Rhett, and John P. Grace, the pipes expanded throughout the city, and citizens were encouraged to pay the fee to tap into the new system. Until the early 20th century, Charleston had thousands of outdoor privy houses downtown that spread disease and stench, and the modern flush toilets offered a giant leap into the modern era by discharging into pipes that could move sewer elsewhere.